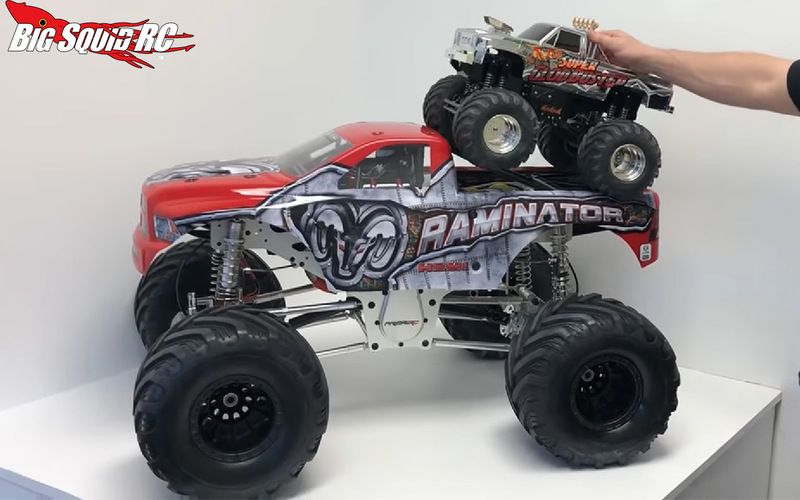 Monster Truck Madness – Let’s talk about that gigantic Raminator « Big Squid RC – RC Car and Truck News, Reviews, Videos, and More! Hey all, good news- we are almost through winter! Yeah, yeah I know, I can hear many you saying “it’s cold here until May”. I get it. But hey, March is almost here which means spring is coming, which means it’s almost time to go bashing outdoors again! So using that thought as the thinnest of segues, bashing outdoors would be mandatory for the gigantic vehicle that I want to discuss today, the Primal RC 1/5 Raminator Monster Truck. Large scale monsters aren’t necessarily that rare these days, but the fact this is a solid axle truck makes it a big deal. So while I have had no hands on time with it and know about as much as you all do about the truck, I figure everyone else is offering their thoughts on it so why not the guy with the monster truck column? So first off, it’s super cool to see that Primal went and worked together with Raminator for a fully licensed version of the truck. For those unaware, the Team RAM trucks are some of the top performing independent (read, not owned by Monster Jam) monsters on the circuit. They are a good get! The beast weighs 80 pounds! I come from the 1/10 monster truck racing world where modified Clod Busters are considered pretty heavy if they go north of 10 lbs, so yeah, this thing is on another level. I mean, look at the picture at the top of the page. That is an actual Clod sitting on the back, and it looks tiny! The truck comes with a 49cc engine with a reversing unit. You know, the roar of a full size monster is probably the main part of the experience that gets removed when driving electric trucks, so this will likely have that in spades. Lining a couple of them up and racing would sound awesome! They did a good job on the tires, as they are pretty good recreations of hand shaved 66″ terras. The million dollar question- wait, check that, let’s make it the $3000 question (i.e. the retail cost of the Raminator) is how will it perform and hold up to abuse? While I’ve no personal experience with the truck or company, I will say that after watching this detailed overview video of the truck (monster truck fans, it’s well worth the 17 minutes to watch) that I feel pretty good about how this thing will work. Everything appears to be either steel or aluminum construction, and the components are all designed with a lot of customizability for the end user in mind. For example, with different mounting holes, you can significantly lower the stance of the suspension. It should also be noted that thing monster is equipped with actual pinion brakes. F*** yeah, how cool is that? If you couldn’t tell by now, I am REALLY excited about this thing. Good on the folks at Primal RC for putting this kit together, and I really hope that it both drives and sells well for them. And of course, you know I’m DYING to get in some trigger time with one of these! Time to starting putting extra pennies in the piggy bank.